It’s well-known that social media isn’t simply a broadcast platform. Any successful social media strategy includes sharpened social listening to know who you are and aren’t reaching within your industry—as well as what content you should be developing to best suit your community’s needs. The social listening market is growing quickly; a Forrester analysis found that in 2014, more than 50% of marketers expected listening budgets to grow by at least 5%. But without the right tools and resources in place, content creation for social can be a daunting and very manual task. Here at Sprout, to optimize and inform our content strategy, we often use the Twitter Keyword Report. 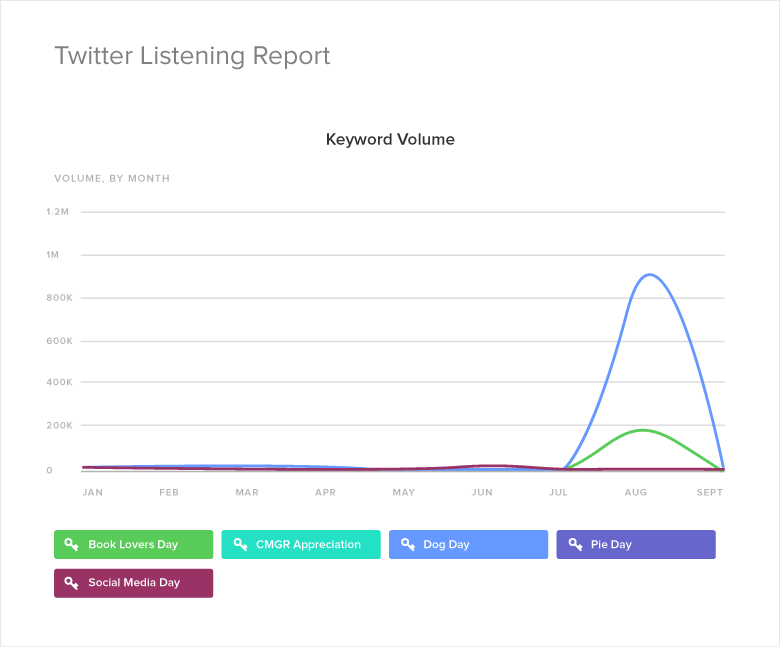 This report enables us to dive deeper into social data surrounding the Brand Keywords and hashtags relevant to our industry that we’re already monitoring within the Smart Inbox. For example, while creating our annual Hashtag Holidays campaign, we depended on the Twitter Keyword Report. We tracked the share of volume for specific national days—like #NationalMartiniDay and #HugYourBossDay—and determined which hashtags garnered the most activity. From there we built handy digital and analog calendars to share with our community of marketers and social enthusiasts. By analyzing the Twitter message volume for each holiday, we’ve been able to hone in and identify which resonate. It also gives us a more informed decision-making process while we search for new holidays to incorporate and keeps each year’s campaign fresh.